Beware the scope creep monster, it is known to drive project managers, designers and developers to madness. Apparently it’s inability to correctly judge the size of a task is mostly to blame, and not it’s unholy fusion of slug and arthropod. 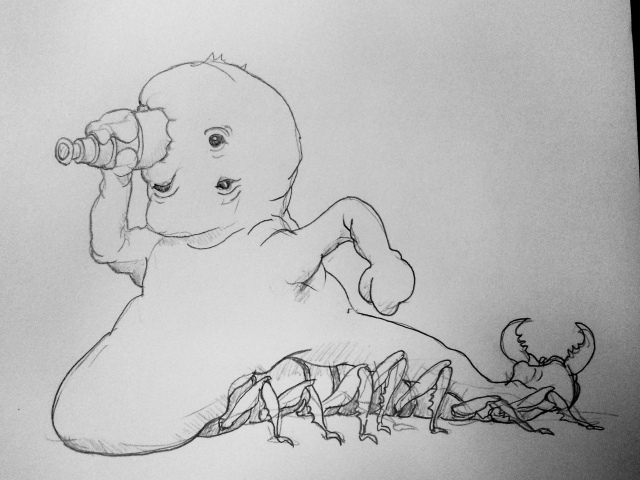 This entry was posted in Quick Desksketch and tagged monster, scope creep, website by Anthony. Bookmark the permalink. Thanks Anthony, I have just pinned the “scope creep” monster up on the board for the developers to fear!!! Thanks Tim, I am glad you liked the sketch. Apparently it also had a certain appeal for some project managers too, or so I was told.